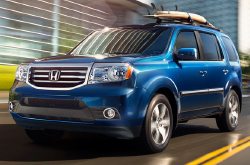 2013 Honda Pilot reviews from Vandergriff Honda can be found underneath the video below. Vandergriff Honda is a top-rated Honda dealership in Arlington for a reason. We provide you with reviews written by automotive writers at the height of their craft. Once you begin to read, you'll find that this article is crammed with essential features and information. What are you waiting for? Watch the video below or start reading the 2013 Pilot review below! When comparing the 2013 Honda Pilot side-by-side with the 2013 GMC Acadia, Mazda CX-9, Hyundai Veracruz, Buick Enclave and the Chevrolet Traverse, and you'll see that the Pilot ranks above those autos in loads aspects. Catch a glimpse of just a few of the reasons below. Don't travel to a megacorp car repair shop in Arlington when Vandergriff Honda's amazing Pilot experts are only a brief cruise away from your household. We also protect our patrons with a lengthy warranty on our repairs - more than most megacorp shops do. Hondas in Arlington can take a pounding, so turn to the auto repair experts in Arlington - Vandergriff Honda. Our techs can work on a gamut of jobs - from strenuous stuff like Honda muffler repair to less laborious assignments like battery and timing belt replacement. Vandergriff Honda is your best bet in Arlington for quality, professional Honda repairs and routine maintenance. The ensuing link is your highway to big savings. Click now to be taken to to Vandergriff Honda's specials.